Zoom in of the flare peak, in which oscillations are clearly seen. A flux spike, lasting only about 20-30 seconds, is seen at the beginning of the oscillations approximately 8 minutes after the night start. A green interpolating line is shown to aid the eye. Credit: Jackman et al., 2018. 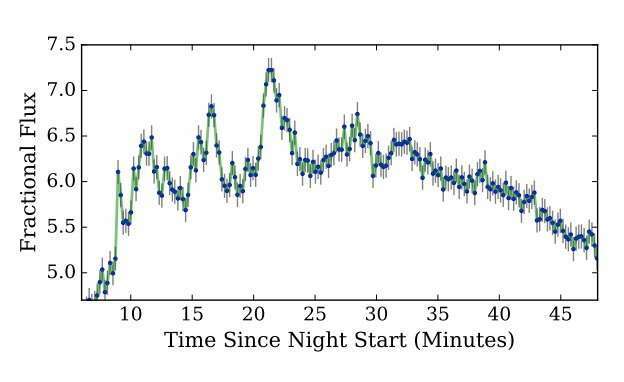 Using the Next Generation Transit Survey (NGTS), astronomers have identified an energetic flare displaying quasi-periodic pulsations on the pre-main sequence M star NGTS J121939.5-355557. The newly detected flare is one of the most energetic flares seen on an M-type star to date. The finding is reported in a paper published November 5 on arXiv.org. Stellar flares are energetic and impulsive releases of large amounts of energy from a star. They occur when a shift in the star's magnetic field accelerates electrons to speeds approaching that of light, which results in eruptions producing emission across the entire electromagnetic spectrum. While flares from M stars provide some of the most dramatic stellar events, they are difficult to predict. Spotting such activity on this type of object requires long-duration measurements of many stars, which can be provided, for instance, by wide-field surveys for transiting exoplanets. Recently, a team of astronomers led by James Jackman of University of Warwick, U.K. has analyzed observational data collected by NGTS between November 2015 and August 2016. NGTS is a ground-based transiting exoplanet survey consists of 12 telescopes. The survey is able to detect and resolve flares on both single and blended objects. NGTS allowed Jackman's team to detect a flare on NGTS J121939.5-355557 (NGTS J1219-3555 for short) on January 31, 2016. Located some 685 light years away from the Earth, J1219-3555 is a young (around 2.2 million years old) star of spectral type M3 about the size of our sun, however slightly more than five times less massive. It has an effective temperature of 3,090 K.
"In this work, we have detected a high-energy stellar flare from the 2 Myr old pre-main sequence M star NGTS J121939.5-355557 with NGTS," the researchers wrote in the paper. According to the study, this flare had an energy of 3.2 undecillion erg and a maximum amplitude of 7.2. The astronomers noted that this energy is greater than all M dwarf flares observed with NASA's Kepler space telescope and is comparable to that emitted by the highest energy G star superflares. They added that the newly spotted flare is one of the largest energy M star flares ever observed. Furthermore, in the flare peak the researchers found significant multi-mode quasi-periodic pulsations (QPPs). The team underlined the importance of this finding as although such pulsations are commonly observed in solar flares, they remain relatively rare in stellar flare observations. The QPPs in the flare of NGTS J1219-3555 are formed of two statistically significant periods of approximately 320 and 660 seconds, with an oscillation amplitude of 0.1. The astronomers added that these values make the flare described in the paper one of the largest amplitude events to exhibit such pulsations. In concluding remarks, the researchers underlined the importance of wide field, long timescale surveys such as NGTS in the search for high-energy events like the flare in NGTS J1219-3555. Finding and studying these flares could be important for improving our understanding of formation and habitability of Earth-like alien worlds around M-type stars.